Sing along, laugh along and join these brave kids on a ghost hunt full of eerie surprises. BOO! There are skeletons, bats and haunted houses. 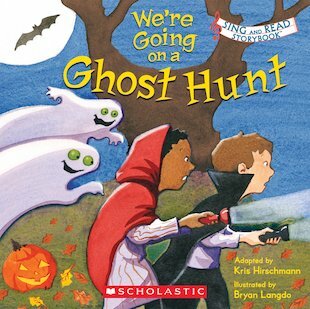 But these ghost hunters aren’t afraid! Are you? Rhyme out loud as the trick-or-treaters roam through dark backyards and alleys, letting their imaginations run wild. A muddy puddle becomes a swamp and tree branches look like skeletons. But they’re not afraid. And nor are you! Cheery illustrations, bouncy rhymes, thrills and chills: one for all you brave kids who love to be spooked – just a little!